Berluti, now under the creative direction of Ackermann, was one of the stand-out shows of the season. It was glorious. Just glorious. Minimal luxury completely nailed — a breath of fresh air in a menswear climate where Instagrammable clothing reigns supreme. A pale pink floor, smoke pumping onto the runway, Liza Minnelli’s Losing My Mind playing as the lights went up, and the chicest front row imaginable: Call Me By Your Name’s Timothée Chalamet, actors Louis Garrel and Isabelle Huppert all looking divine. Outerwear was particularly strong: belted leathers, shearlings, fluid parkas. 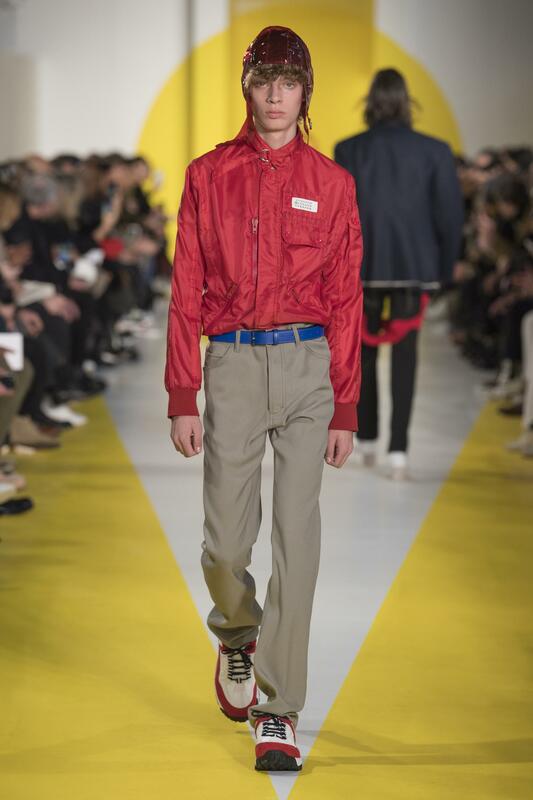 Balenciaga didn’t do a men’s show this season but it showed its first men’s pre-fall collection, which included trademark Cristobal Balenciaga voluminous outerwear that looked fantastic. Conclusion: the oversized, long, possibly belted robe coat is definitely here to stay. Fried egg yellow was my initial thought on arriving at John Galliano’s first official menswear collection for Maison Margiela — the runway had been decorated for maximum impact and it set the scene for a collection that pushed bold colour as a central theme. The first look out was a double-breasted red wool coat, soon to be followed by a full look in Yves Klein blue and an Aran knitted orange belted cardigan. Colour combo of the show? Red with beige. Best looks? The tailoring, particularly a sublime pinstripe double-breasted suit. Elsewhere, in Kim Jones’s last collection for Louis Vuitton, neon yellow or orange sweaters and bags were the only things not (naturally) somewhat momentarily upstaged by the appearance of Kate Moss and Naomi Campbell. Yes, brown: it’s the new navy. It was everywhere during the autumn/winter 2018 men’s shows. At Marni, the audience sat on a variety of objects, from a Hoover to a sledge. It set the scene for a show that overflowed with a brilliantly crumpled randomness. A super long brown coat moved with a wondrous swing, another featured illustrations by artist Frank Navin, including contrasting yellow upholstered chairs, while a brown track top was teamed with navy bottoms and sandals. Rather different but equally striking was Rick Owens. Throbbing techno, flesh-revealing cut-outs and, yup, brown — coats, a jumpsuit and a cloak. Curveball or a bit of a fashion eye-roll? Actually, for a season that often felt like designers were treading water, one notable thing was an abundance of great slacks. Let’s deal with the white ones first. Lemaire, which was an exercise of pure Parisian elegance, featured a particularly winning pair: high-waisted, roomy. Haider Ackermann showed cropped, raw hem white jeans. The excellent Wales Bonner gave hers a gingham waistband. Dries Van Noten, meanwhile, toyed with white broderie anglaise. In other trouser news: Versace cropped cords, McQueen cropped flares and the rippling width of cut as seen at Hermès — all pleasing. Mrs Prada may have been talking about “strange mysteries, strange animals” emerging from the crates stacked at the show venue but her catwalk had a very clear statement: nylon. The show opened with an immediate homage to the fabric that Prada has owned since the mid to late Eighties. These nylon looks were padded, often in black, brilliant in blue, though notably they were not quilted. The padded coat has had a major season: diagonal quilted versions at Fendi, oversized with multi-drawstrings at Y/Project, while Balenciaga’s versions were finished with frayed denim or calf-skin leather. There was also padding galore (trousers, long coats, blazers) in Thom Browne’s snowy extravaganza, while Valentino cleverly hooked up with Moncler for a collaboration. There is no getting away from the fact that designer sneakers continue to sell out and create social media mayhem — see theTriple S sneaker by Balenciaga, which was out in force at the shows. Fendi’s collection featured a lot of good clothes, but with its moving luggage carousel and models wheeling suitcases it was arguably an accessories spectacular. Pumped-up sneaker soles are definitely a thing, and Fendi’s were either a sock-style boot or an Air Max-esque lace-up. Every one of Valentino’s 48 looks was finished with a heavy tread trainer. Versace’s take on this idea is a chain-link sole with hiking laces. In other shoe news: both Sacai andY/Project brought back Uggs.Discuss. It’s not exactly breaking news to see layering happening for autumn/winter but this season trying to count how many layers in an outfit became quite the exercise. One look at Lanvin — another excellent turn by Lucas Ossendrijver — was made up of mock neck, shirt, suit jacket and a padded gilet. This collection, which had the suit at its heart, was literally brimming with modern ideas of how to dress now: mashing up anoraks, fleecy zip-ups and tailoring. Vetements returned to the runway — outfits were layer upon layer- shirt, hoodie, coat, T-shirt. At Balenciaga, like Vetements, which is also designed by Demna Gvasalia, there were shirts that came attached with either another shirt or a T-shirt: ie, directional layering served up on a plate. Modern. Before the hysterics over knitwear, let’s pause and take a Hermès moment, shall we? If you want to work out how to look both unbelievably chic and effortlessly attired, just study this show because the styling, the colour palette and overall wearability of the looks all just felt so right. The fact that the models (with all their good hair) marched through flaming cauldrons only added to the atmosphere. Bravo. Anyway, jumpers. Loads of jolly ones this season, from the abstract scenes at Hermès to Missoni’s marvellous multi-coloured Hockney vibes via wonky ones at Lanvin and Fair Isle numbers at Acne Studios. Spoilt. For. Choice. Dot. Com.